The Donut Man (Rob Evans) has been spreading his family-friendly values for over 20 years. He uses loving songs and simple stories to teach children the timeless Word of God in a way that's fun and meaningful for them. He's also been honored with an Angel Award, and a Dove Foundation "Family Approved" Seal. Rob and his wife Shelley have six children. Ages 3-10 Camp Harmony - The kids from the Donut Repair Club share outdoor fun, fireside story song, and lessons about cooperation. Songs include "Only One," "The Buddy Song," "The Potter's House," and more. 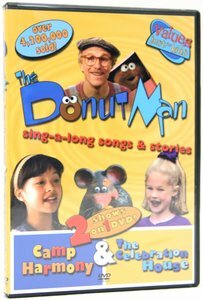 The Celebration House - The Donut Man and company fix up a community center and learn the joy of helping your neighbours. Songs include "This Is The Day," "I'm Glad I Live In A House," "I Wanna Be Great," and many more. About "Camp Harmony and the Celebration House"